In around 1929, at the age of four, Len Saunders arrived at the Croydon workhouse, apparently "discarded" there by parents of whom he knows nothing. His memories of the next decade are largely of hard work in the laundry, beatings, and abuse. He finally escaped what by then had become council children's homes by climbing over a wall and running away. He eventually became a miner in Yorkshire after lying about his age. Over sixty years later, many of his memories are still too painful to recount. The following reminiscences were recorded in July 2005. The audio clips (each approximately 2 minutes long) are in MP3 audio format. 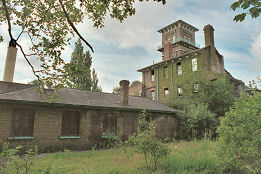 Len is very keen to get in touch with anyone else who was at the Croydon workhouse and homes during this period. Please get in touch if you can help.